The power of a good benefit concert on a Friday night | Rrampt. I don’t dance. But my boots do and they danced up a storm on Friday night. The music was spectacular, the love free-flowing, so I went along for the ride. For an introvert, I felt surprisingly in my element, caught in hug after hug, stuck on the dance floor, and floating through crowds of strangers-but-not-strangers. 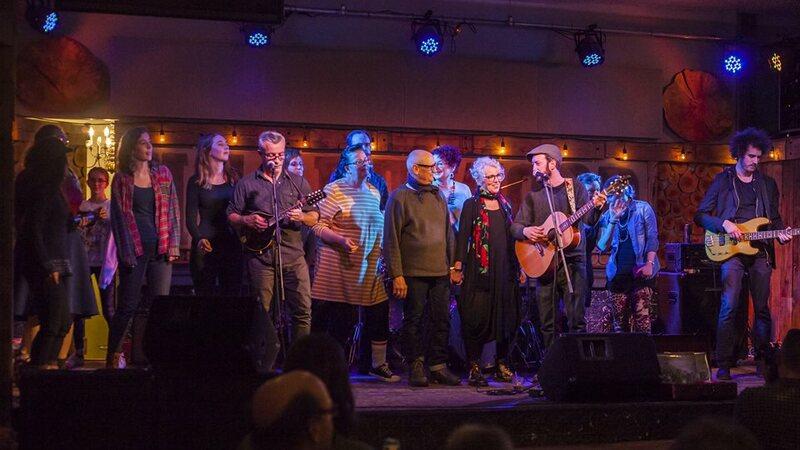 Heartwood was hopping with a benefit concert for the Women’s Centre Grey and Bruce that ended up raising $4000. 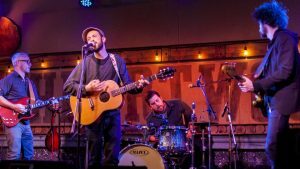 Toronto-based band, Freeman Dre and the Kitchen Party headlined, with opening entertainment by locals Lauren Best, Jayden Grahlman, and Sophie Wensley, and a silent auction was set up with some fantastic items donated by local artists and businesses. The event was pulled together by the unstoppable heart and force of Denise Freeman, Board Chair of the Women’s Centre and mom of Freeman Dre. There’s a kind of magic that happens in this small community of Owen Sound. The people here have a beautiful way of pulling together to support one another. That’s exactly what we saw on Friday night. The house was packed with friends, family, and love for this cause. As Denise told the crowd, it would be wonderful if we didn’t need the Women’s Centre. But we do. And this town makes sure it will always be available for anyone who needs it. She spoke of the recent movement of #metoo, and how it has hit a turning point. That every single person who stands up and shouts “Me too,” is now saying, “Me too. I’m in this and I’m part of the solution.” The crowd clearly agreed, and it was powerful to witness. 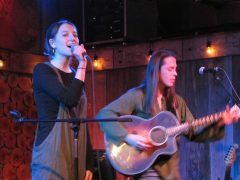 We were fortunate to have a lineup of incredible musicians who donated their talent so the fundraiser would be possible. A great cause unites people and music is the magic that brings us together. We saw it right away with Lauren, Owen Sound’s Poet Laureate. She took to the stage with a tangible energy, a sort of vulnerable strength, as she sang a hypnotic lullaby of affirmations. We witnessed her first time playing her electric guitar in public, and it was this rhythmic strumming that first set my boot toes tapping. Most impressive, perhaps, was when Lauren recruited a handful of volunteers to join her on stage, strangers coming together to recite poetry to the gentle humming of Twinkle Twinkle Little Star. It was simple and beautiful. Next up were Jayden and Sophie. Anyone who spends any amount of time in the Owen Sound music scene will instantly recognize Jayden from the group Higher Funktion. He has a fundraiser coming up for his new solo album, “Diving In“. You’ll want to keep an ear out for its release! His impressive guitar skills were perfectly paired with Sophie’s vocals. At just 16 years old, this young woman is a powerhouse. Her voice is impeccable, effortless, and full of old soul. I have no doubt she will be headlining at Heartwood within a couple of years. My boots kicked on again as soon as their set started, shuffling in between all the hand-stamping I was tasked with at the door. But once Sophie began belting out Valerie with a vibe to rival Amy Winehouse, there was no stopping them. They went into full dance mode and I couldn’t have stood still if I tried. The main act, Freeman Dre and the Kitchen Party, came out to a crowd that was warmed up and ready to really get down. This group – made up of Freeman Dre, Lon Tron Silver, Big Neil Mac, and Joe E Bones – knows how to put on a show. If you want a little taste of what these guys can do, they have a new recording out from a performance they did at Quixotic Sounds in Toronto, available on their website. But to really feel their energy, you have to see them in person. With Lonny’s fiery guitar and mandolin playing, Joe’s rolling baselines, Neil’s heart thumping percussion, and Dre’s guitar and smoky vocals to top it all off, every beat is electric. All it took was the first gravelly wail of “Ohhhhh yeahhhhh….” and the music sank right through my soul, down to my boots. I tried to sit still. I really did. But then a friend insisted that we go dance, and of course those boots jumped off the stool and I had no choice. Now, there’s a reason I don’t dance. I’m spastic and tend to injure myself and others when I do. So, I know it’s the mark of an incredible band when I willingly follow my boots onto a dance floor and let loose. By the time Babylon began to play, the crowd was unstoppable. The floor was packed; as the tune ramped up, more people just kept spilling up to the front. Dre’s call of “Faster! Faster!” was obeyed by all, four or five times over. 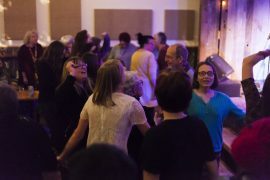 The music came to a reluctant end so everyone could breathe, but a joyful buzz continued throughout the hall as friends mingled and perused the silent auction, awaiting the second stellar set. It started off mellow, but people trickled back to the dance floor, eager to keep the party going. Someone beckoned to me again; at this point in the evening, resistance was futile. And then, the slow nostalgia of Whatever It Takes began to float through the air and I was caught in the moment. Maybe it was sentiment, or maybe it was just one of those moments of perfect timing that’s made even better by a favourite song. But I turned around and saw a beautiful woman sitting behind me. What else could I do? The boots wouldn’t stop, so I asked her to dance. We were basically two awkward teenagers, giggling and stepping on toes. Best slow dance ever. The love just kept on rolling along as a few songs later Dre dedicated Six Hundred Feet to his mom, Denise, and her wonderful husband, Edward. True love right there, folks. And isn’t love what it always comes down to? Well, it should be, anyway. That was the whole idea behind this event, after all. The night wrapped up with Dre inviting anyone and everyone on stage to sing You Are My Sunshine with the band. The stage filled with people eager to join in the moment of pure camaraderie. We didn’t all know each other, but we had come out that night for the same reason: to show support for all who need it. To have a heart. We saw an outpouring of love that night, radiating from every single person there. I think everyone is a little fuller from it, and our community has certainly been made stronger. Endless thanks to all the musicians, businesses, and artists who made this evening possible, John Farmer the fantastic MC, and to each person who attended. Huge congratulations and thanks to Denise for organizing this entire event – her first time putting together something of this scale, no less! And last but not least, thank you to the Women’s Centre Grey and Bruce and all of the workers who strive to maintain a safe space for women in need of protection and support and their children. It takes a village.